"The average American eats about 55 pounds of beef a year. But bison consumption per capita barely adds up to a couple of burgers. As bison meat picks up new fans, though, especially among high-end chefs, bone broth enthusiasts and the #paleo crowd, 2 distinct views have emerged on how to treat the animals. On one side are old-school ranchers — like the billionaire Ted Turner, who owns 1.9 million acres of land and more bison that anyone else on the planet — who send their bison to feedlots and slaughter them like conventional cattle. On the other side are people who think America's red meat should be raised as wild as possible and slaughtered as humanely as possible. Dan O'Brien, owner of the 23,000-acre Cheyenne River Ranch just west of the @badlandsnps, falls into this second category. 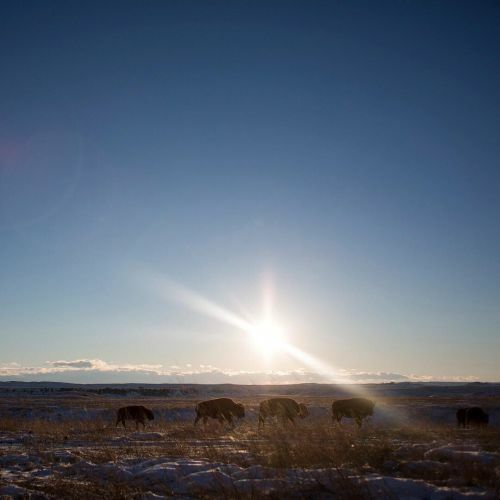 @kristinabarker photographed bison grazing on Dan's ranch while on @nytassignment for @nytfood." By nytimes on Instagram.